Hosting a girls night in that focuses on beauty can not only be good for you but also fun & inspiring. Everyone has their own products that they love to pamper themselves with so why not get together with your friends and swap beauty secrets! I am always up for learning about new facial scrubs or a great nail color!! Get super girly with it & treat yourself!! I love this! My friends and I have a girly night every other week and we all just chat and drink Diet Coke but this would be such a fantastic and fun thing to shake it up! I am so going to do this! That’s a great idea! I think I may do something like thata with great homemade food for my friends next week! Thanks for the tip, soemtimes we forget the good and simple things ! I love this idea! Forget girls night out, this is the perfect girl’s night in! Oh my, such a great idea and fabulous excuse to dress up a little! 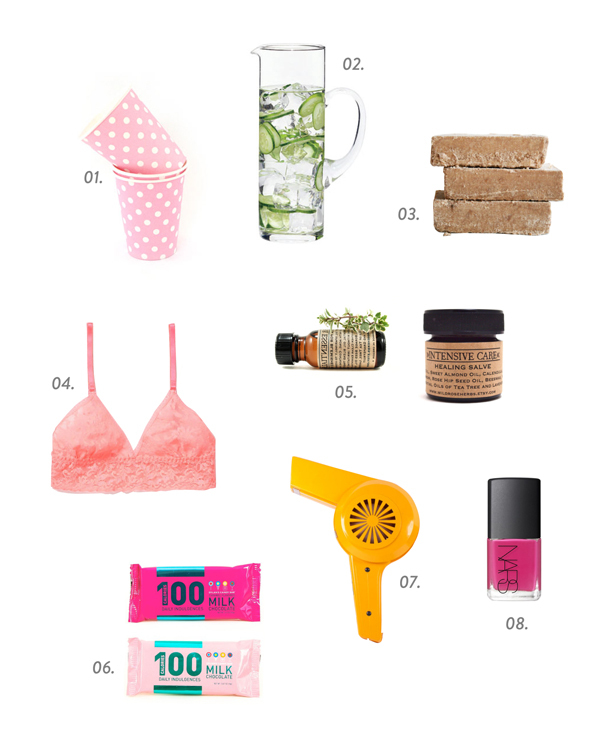 All of those little luxuries look perfect. I could use a treat or two right now! perfectly pretty for pampering. love it all! Fabulous selection of “treat yourself” treats! That is such a cool idea! I’m always trying products based on recommendations, so why not have my girls gathered in one place with their beauty chests. Fab!